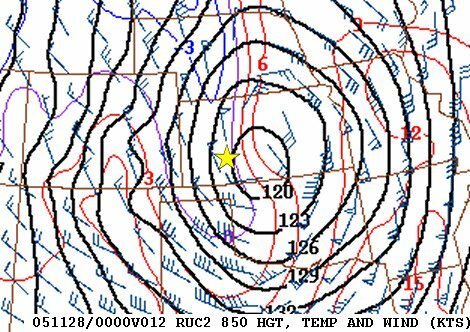 Near-Blizzard possible later today on the KS High Plains! A powerhouse winter storm will explode over Kansas later today. The NAM and GFS models have been slow to catch on to the rapid deepening of the system versus the ECMWF and UKMET models. A surface low will deepen rapidly over southern KS later on today as a wedge of cold air knifes down western Kansas. Looks like any rain will change quickly to snow between noon and 3pm here in Dodge with bouts of heavy snow through 9pm this evening. 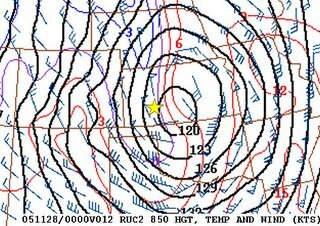 850mb wind progs of 50-60kts at 850mb suggests that winds at the surface will become sustained 30-40mph with gusts to 50mph during the snow. Even though the ground is initially warm, these strong winds and heavy snow will rapidly cool the surface such that snow will indeed stick rather quickly… and there could be a significant mess for a lot of western KS west of, oh.. a Smith Center to Russell to Great Bend line. I think the real winner in KS may be the corridor from Hill City to Smith Center where some spots may see 7 to 10″+ of snow with around 6 hours of blizzard or near blizzard conditions. I get to go into work at 2pm to work the event here in SW KS… should be a fun one… stay tuned!